Sago palms (Cycas revoluta) make a bold statement with their dense crown of feathery, evergreen fronds and stout, shaggy trunk. As subtropical plants, they thrive in warm, humid climates and grow in U.S. Department of Agriculture plant hardiness zones 8 through 10. 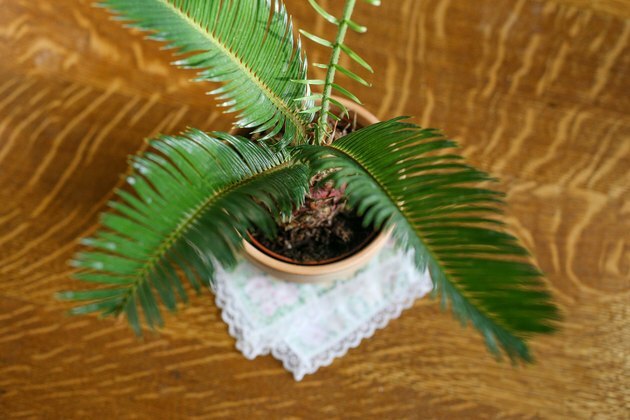 Sago palms are slow-growing but require little attention once established in a suitable spot. Some occasional hands-on care will go a long way toward making the plants look healthy and vibrant. 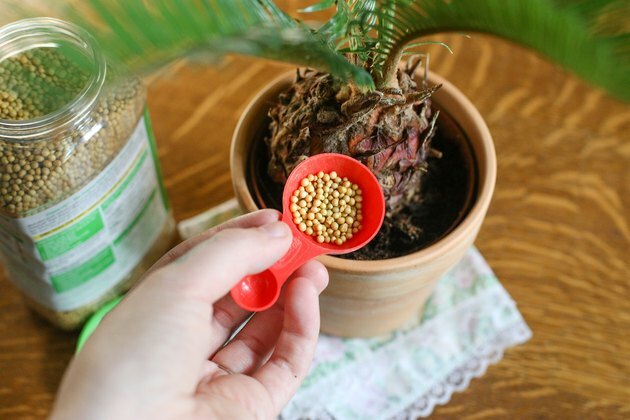 Getting the soil's moisture level correct is vital to successfully growing sago palms. Soggy soil creates an environment for diseases such as stem rot, while soil that's too dry can cause stress. Deep, regular watering is best because it will promote a deeper root system than frequent, shallow watering. Provide 1 inch of water weekly during the summer, but make sure the soil has dried out in the top 3 inches before watering again. 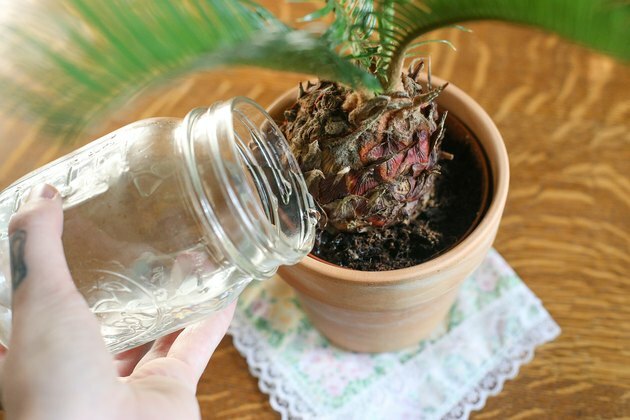 Increase watering if the sago palm shows signs of heat stress, and stop watering during rainy weather. Sago palms have only one or two flushes of growth throughout the year. As a result, they seldom require fertilizer if grown in organically rich garden soil. One exception to the rule is if the shrub shows signs of a nutrient deficiency such as yellowed fronds or excessively slow growth. Applying a slow-release, organic fertilizer, such as blood or bone meal, may help, as will feeding with a palm formula fertilizer applied at a rate of 1 pound per 100 square feet of garden area. Apply the fertilizer in midspring and early fall, on moist soil to prevent damage to the shrub's coralloid roots. With their dense crowns and symmetrical growth habits, sago palms do not need pruning to look attractive. They may need tidying up throughout the year to remove dead, damaged or discolored fronds. Snip off the unwanted frond at the base, but be careful not to nick or puncture the growing point where the leaves emerge. Prune off any cold-damaged fronds in spring after the weather warms and normal growth resumes. Before pruning sago palms, sanitize the pruning shears to limit the chances of transmitting disease. Soak the blades in full-strength household disinfectant or a solution of 1 part bleach and 3 parts warm water for five minutes, then rinse them well in clean, hot water and wipe them dry. Good general care will prevent most serious issues in established sago palms, but they may develop minor infestations of scale insects or mealybugs in areas where those pests are prevalent. 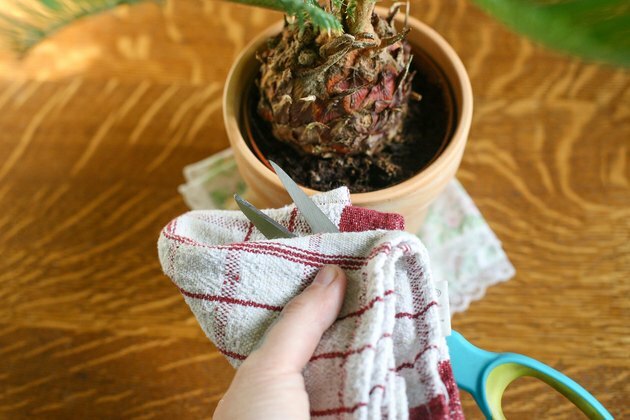 Spray infested plants with lightweight horticultural oil diluted at a rate of 2 ounces per 1 gallon of water, or at the label-recommended rate, paying special attention to the undersides of the fronds. 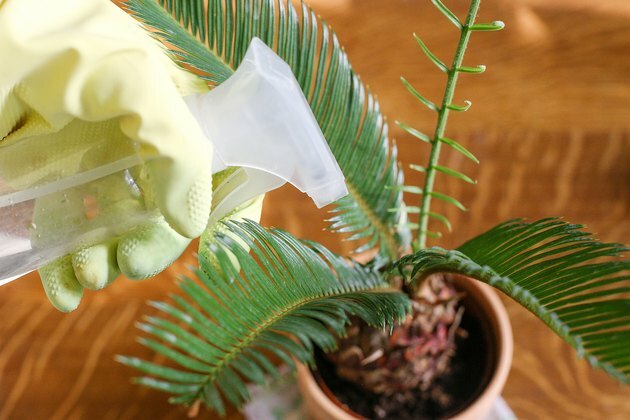 Apply the solution in summer in the cool, moist morning, and water the sago palm the night before spraying to help alleviate stress. Wear protective clothing and goggles when working with horticultural oil, and try to stand downwind to avoid getting the spray on you. Most minor infestations will be mostly gone in one to two weeks with weekly applications, but heavier infestations may take longer to control.